DESC is working on an affordable housing development in North Aurora Avenue neighborhood in Seattle. 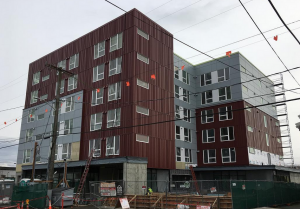 This new DESC supportive housing development will create 99 studio units of affordable housing with supportive services for people with significant disabling conditions like serious mental illness, substance use disorders, and physical disabilities. Clement Place got its name from long time DESC staff member Dan Clement. Dan worked at DESC from 1994-2010. He was one of the original staff on what would become the HOST team before serving as the Project Manager of Kerner-Scott House and then Rainier House. Aside from the clear dedication exemplified by his long tenure with DESC, Dan was a role model to many, embodying a calming and engaging presence that formed lasting relationships with staff and clients alike. Dan passed in 2015, but his memory lives on in Clement Place and work we all do everyday. This building will have its public opening on April 9th, 2019. Join us!